In the enforced absence of a Beatles reunion, we’ll have to make do with a comeback for SF comedy’s own Fab Four. Somewhat predictably the Dwarfers aren’t quite as funny as they were in their early‘90s heyday, but even so, their return after ten years is considerably better than the last two series of the show. The best thing about Dave’s three-episode resurrection is that the principal quartet still fit their characters like gloves. They may have spent the last decade cropping up in places like scrapyards and Weatherfield rather than outer space, but – aside from time adding a wrinkle or a pound here and there – you could easily believe it was only a couple of years since we last saw them bickering on Starbug. The script doesn’t fare quite so well. 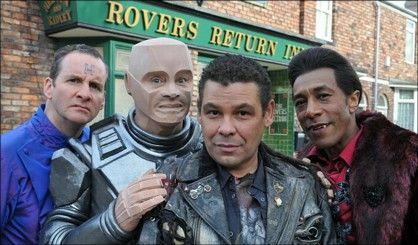 Red Dwarf always worked best as standalone half-hours, and here the story strains over 90 minutes. It’s decent enough when it’s in proper science fiction territory, particularly the arrival of ultra-efficient hologram Katerina (Sophie Winkleman), and the impressive CG sets. But when the crew makes its much vaunted return to 2009 Earth, the attempts at “Hey, we’re really just characters in a TV show” postmodern humour feel like a lazy money-saving exercise, wheeling out crowd-pleasing gags so blatantly there might as well be crib cards popping up reminding you to cheer. Still, Dave has proved that there’s life in the old dog (and Cat) yet, and the scene is set, both fictionally and in real life, for a new series.